Wow! What a rollercoaster ride! 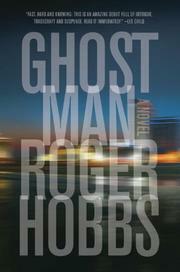 Ghostman is an A1 thriller by newcomer Roger Hobbs, a recent graduate of Reed College in Portland Oregon. This is a book I did not want to put down from the moment I read the first sentence. The protagonist, who hasn’t used his real name since attending College at St. John’s in Annapolis, is the quintessential anti-hero. There are no heroes or heroines on Ghostman. The major characters exist on the underbelly of society, the wrong side of the law, and with unrelenting resistance to honor. Ghostman, aka Jack Delton, is a chameleon, a thief with no fingerprints who lives off the grid and achieves his thrills by participating in high-risk but well-choreographed robberies. He has an aversion to killing unless it is necessary. In his spare time he translates Homer, Virgil and Ovid into English. He is a loner who travels light, always at the ready to morph into another persona. After my recent visit to the International Spy Museum and the exhibit devoted to disguises, I am convinced this is entirely possible. Following a botched robbery in Atlantic City in which the money disappears, Jack receives a contact from Marcus, who had arranged the robbery ostensibly to pay for a shipment of drugs. This is payback time for Jack, whom Marcus blames for a botched heist in Kuala Lumpur that cost him millions and his reputation as a premier jug-marker. Marcus enlists Jack to clean up the mess in Atlantic City and retrieve the money in exchange for not killing him. If only it were that simple! The tightly woven plot moves at the pace of an episode of “24”. The writing is straightforward, clean and intelligent. The Ghostman is the criminal world’s answer to Lee Child’s Jack Reacher – aloof, alone, alert, aware, prepared, methodical, and intriguing. I can’t wait for the next installment-unfortunately, I must. This book should hit the shelves in early February 2013. Loved it! 5 stars!